Bridalveil Fall, of Yosemite Valley in Yosemite National Park, is 620 feet (188 m) tall (the height of a 62-story building) and flows all year round. 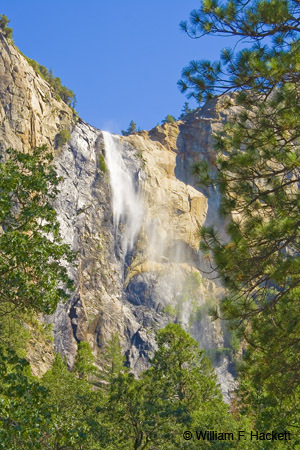 In winter, the ice falling over Bridalveil Fall can make a loud “crashing” sound, in addition to the normal roar of the waterfall. 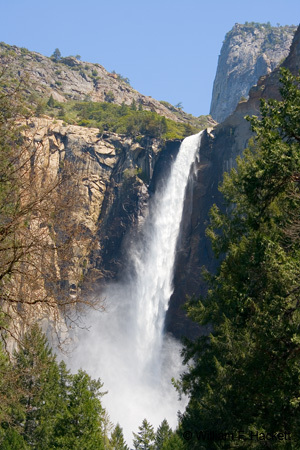 In spring, water from melted snow can add greatly to the flow of Bridalveil Fall and other waterfalls. The glaciers that carved Yosemite Valley left hanging valleys that give rise to the waterfalls that pour into Yosemite Valley. 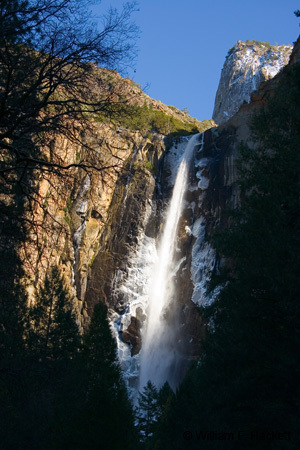 The primary source of water for Bridalveil Fall is Ostrander Lake, which is about 10 miles to the south of the waterfall. 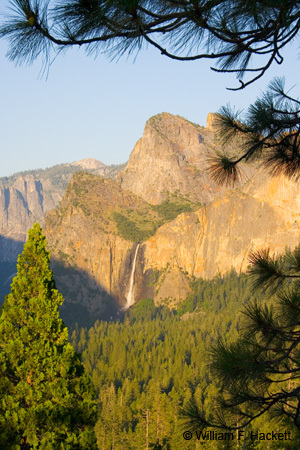 A history of the Yosemite Area can be found here. In a strong wind, the waterfall appears to be falling sideways. The Ahwahneechee Native Americans called this place Pohono, which means Spirit of the Puffing Wind. Pohono was a vengeful spirit that guarded the entrance to the valley. According to legend, those leaving the valley must not look directly into the waterfall, or they would be cursed. Inhaling the mist of the waterfall was believed to improve one’s chances of getting married. Bridalveil Fall is located at the coordinates 37deg 43′ 0.31″ N, 119deg 38′ 47.42″ W.
You can view higher-resolution photos (*generally* 7-30 megabytes, compressed) at the Cheshire Cat Photo™ Pro Gallery on Shutterfly™, where you can also order prints and gifts decorated with the photos of your choice from the gallery. Apparel and other gifts decorated with some of our most popular photos can be ordered from the Cheshire Cat Photo™ Store on CafePress®. Both Shutterfly™ and CafePress® ship to most international locations worldwide! "Bridalveil Fall in Yosemite National Park" was written on June 2nd, 2008 by Bill, and filed under California,Photography.